Inside: Get some inspiration for what to wear this month with these 15 September Outfit Ideas. Quite awhile ago, I retired my cute outfit ideas series. It wasn’t conveying the message I wanted to share with you and ‘cute’ just wasn’t the right word anymore. What you’ve told me you want are fresh outfit ideas every month that aren’t necessarily ‘cute’ but instead doable and age appropriate. You’ve told me you don’t want to look like your teen daughter and you don’t want to look like a granny. You want to dress for you. You want to dress stylishly. You want to dress with confidence. So, each month sometime in the first week, I’ll post outfit ideas just for that month. The series will be titled ‘What to Wear This Month’ and I’ll share fifteen outfits. That gives you outfit ideas for half of the month. I hope you’ll find this series valuable! And as always, if there’s something you would like me to add to the series or another topic you’d like me to cover, send me a quick email at julie at momfabulous.com. September is a tricky month to dress for no matter where you live. In some states, it’s still summer temperatures while in other states it’s getting cold in the evenings. September is the month to layer, which is one of my favorite fashion topics to talk about! 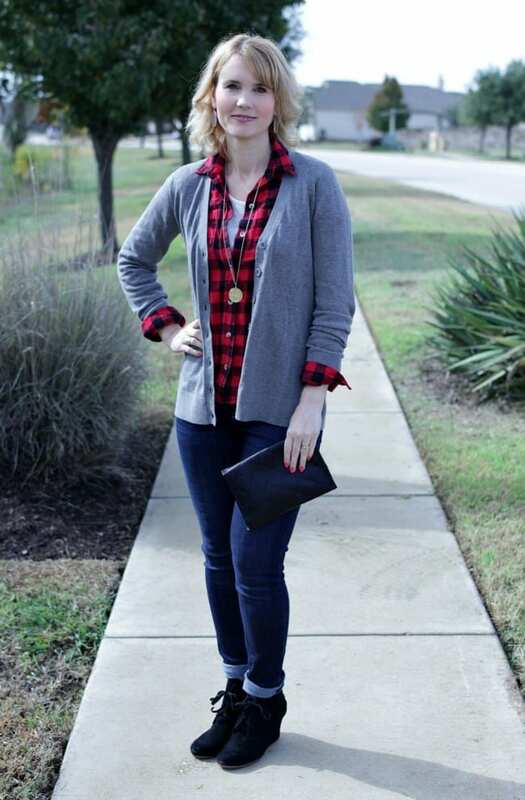 My favorite layering pieces are scarves, boyfriend cardigans, ponchos and utility jackets. Most of these outfits are casual and feature jeans. 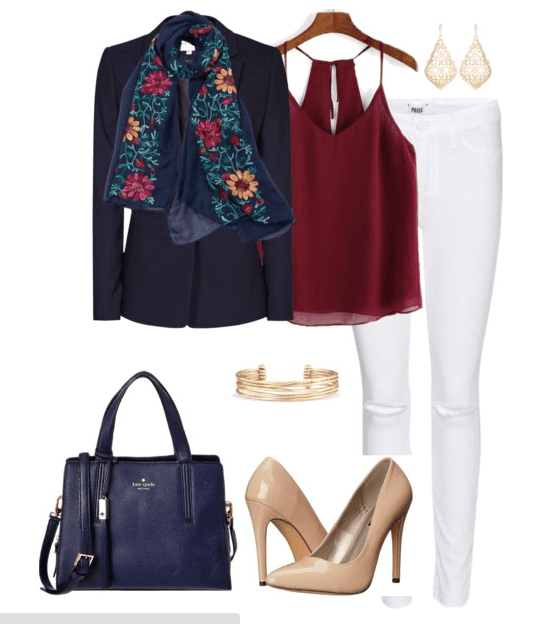 I’m working on creating some fall outfit ideas for work and will post those soon. 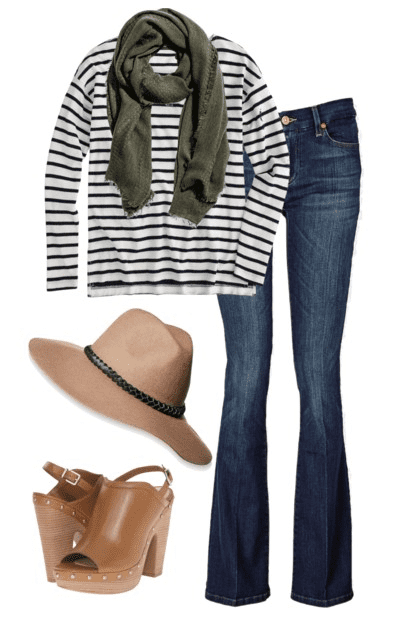 You can’t go wrong with a classic striped shirt! Pair one with an olive green scarf, flare jeans and wedges for a 70s vibe. Or, pair the shirt and scarf with skinny jeans and ankle boots. Olive is such a great color for September. 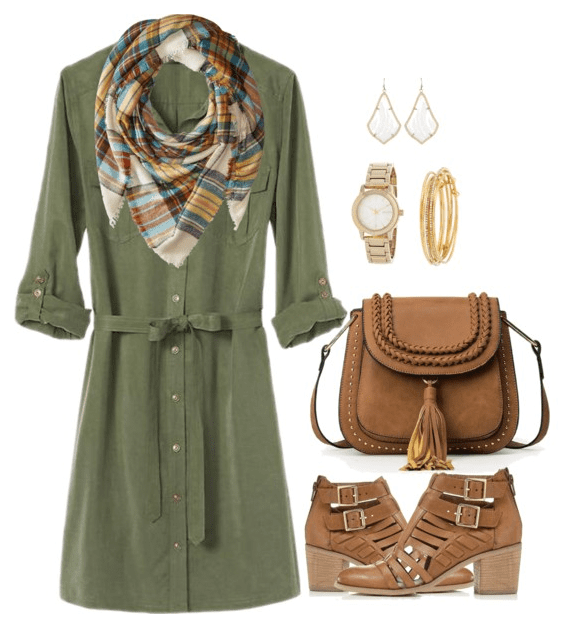 Pair an olive dress with a scarf and strappy ankle boots for a stylish way to transition into the new season easily. Whether you’re in the stands or on the sideline, fall usually means attending sporting events. 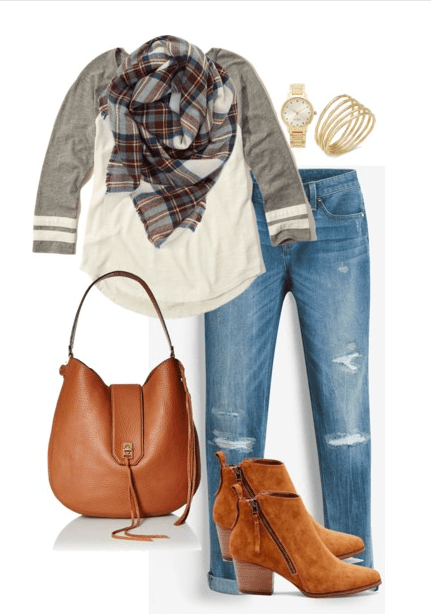 Combine sporty and fashionable with a baseball style tee, scarf, distressed denim and ankle boots. With September still being a little on the warm side, you can still wear sleeveless shirts and camis. 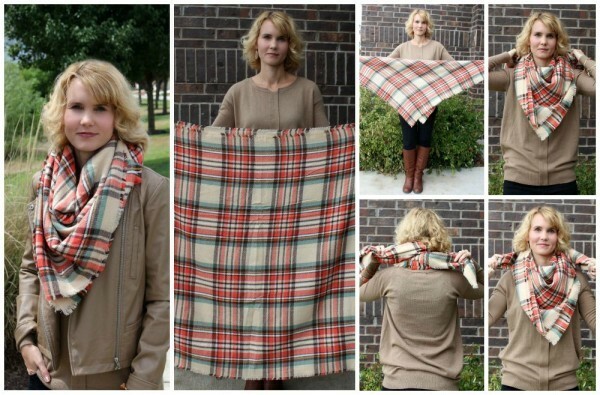 Just throw a blazer over the top of it and finish it off with a pretty scarf. And how great are these two colors together: navy and burgundy? If the heels are a little too much for you, switch them out for ballet flats. In most places, you can still wear dresses in September because the temperatures are fairly mild. One of my favorite outfits to wear is a t-shirt dress with a cardigan and either sandals, ballet flats or ankle boots. If you enjoy wearing leggings, September is the perfect time to break them out. Wear them with a striped tee and a long cardigan + add some cute flats for a comfortable and stylish look. 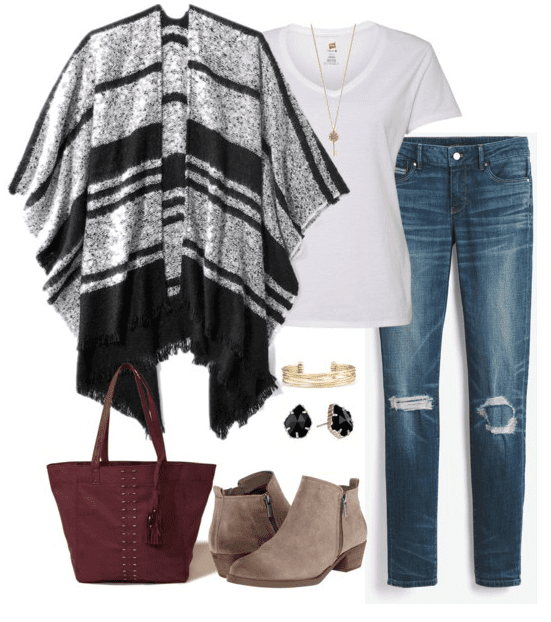 A poncho is a fun way to dress up a white t-shirt and jeans. Plus, it’s great for layering. 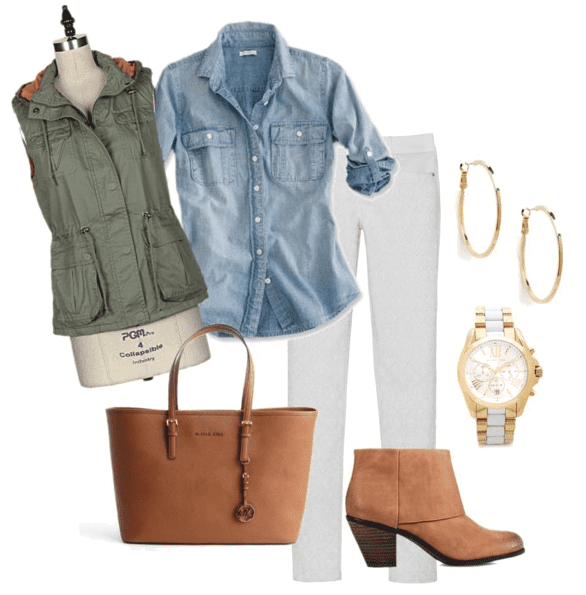 Add a pair of ankle boots and a fall colored handbag for an outfit that just might become a go-to for you. White jeans in the fall? Yep! Add a gray poncho or one in a fall color like burgundy, ankle boots and an patterned handbag for a pretty fall outfit. 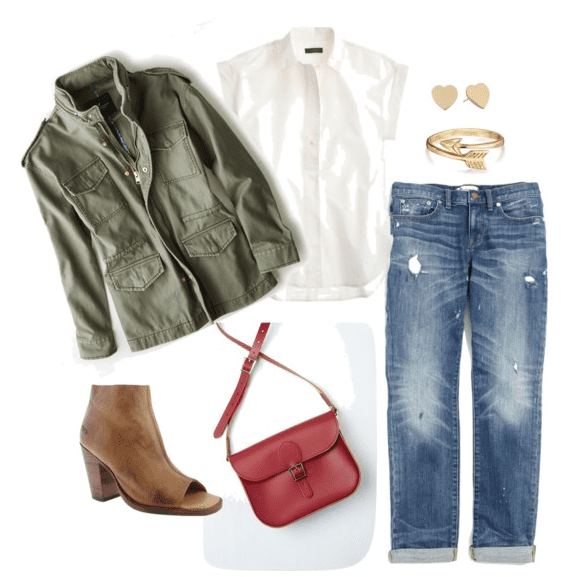 Break out those boyfriend jeans and pair them with a white shirt, utility jacket, and open toe ankle boots. Add a handbag in red for a pop of color. 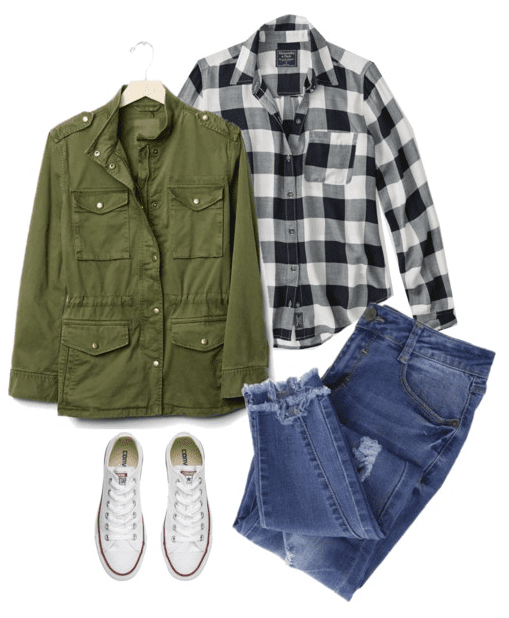 Throw your utility jacket over a black and white plaid shirt, paired with raw hem jeans and white Converse for a look perfect for the weekend. Break out those white jeans and pair it with your favorite chambray shirt and either a utility jacket or vest. 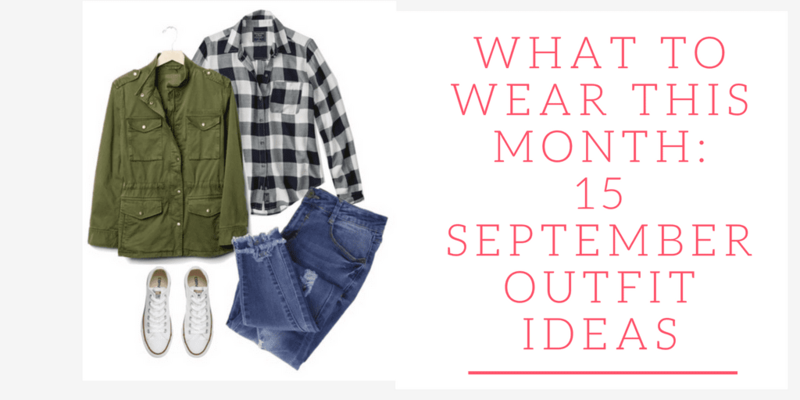 I hope you enjoyed these September outfit ideas and the first post in the monthly series What to Wear This Month! Love these! Makes saying goodbye to summer a little easier! I love these ideas! Thank you so much for sharing them. Now I’m excited for fall. I love these ideas! Will you also supply possible locations to get these looks? Thanks for the inspiration! Hi Lisa! Glad you like them! And do you mean where to purchase the individual items? I have links underneath to them. Let me know if you need anything else! Fun post! I’m pinning a bunch of these. Thank you so much. Great outfits! This really will help me out In the mornings. I like these outfits; however, when I go to click on the corresponding link, it does not bring me to the actual item. 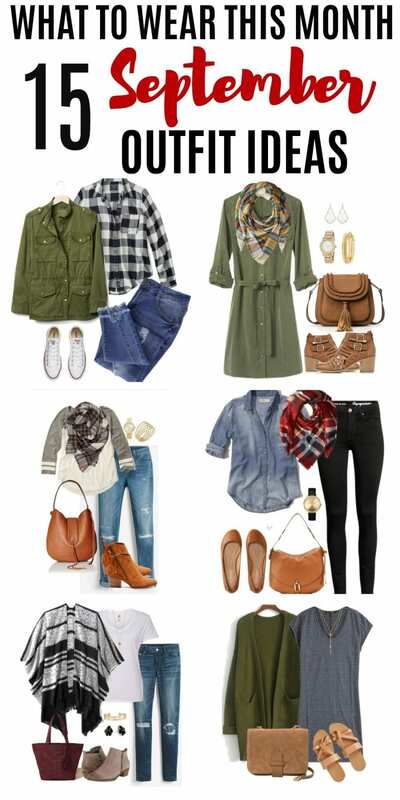 For example, I really like the scarf with the olive dress, but the link brings me to a different scarf. Thanks for the inspiration and any help you can share with me! Thank you for the feedback! I really appreciate it. 🙂 There’s such a high turn over rate with fashion pieces, that I end up having to change out the links for a similar, but not exact, item. I’ll do better at marking when it’s not the exact item so it’s not frustrating for shoppers. I’m glad you like the outfits!